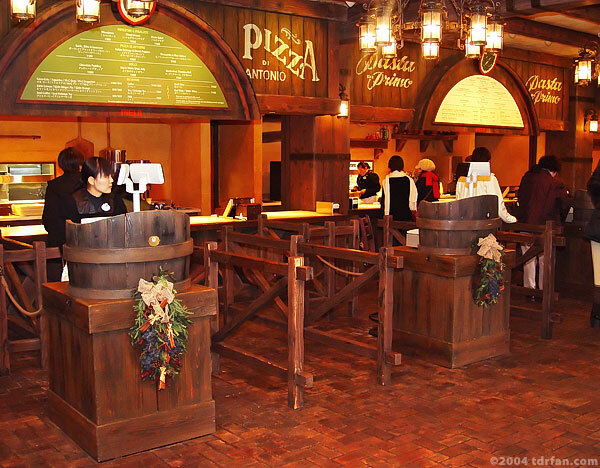 I love Italian food and this is one of my favorite places to eat in DisneySea. This is a big restaurant with two floors of seating, and although it gets crowded I have never had a problem finding a place to sit. There are three categories of food here: pizza, pasta, and risotto (rice). Be forewarned though, that ordering what you want can be tricky. There are three separate ordering stations, one for each category of food. If you want pizza but unknowingly get in the risotto line, you will either have to order risotto when you get to the cashier or get out of line and go to the end of the pizza line. The food here is good, although it doesn't beat my favorite Italian restaurants back home. The pizza choices are a little more upscale but quite tasty, as are the pasta dishes. I haven't tried the risotto but it looks good. There are a good variety of side-dish choices, and like most sit-down restaurants in DisneySea you can purchase beer and wine.